The 9 Best Educational Activities for Children in Wyoming! As any wise person knows, one can never stop learning. From the benign to the bewildering, every day presents moments of education. Add to that an incomparable natural bounty and unique frontier history, and Wyoming is brimming with educational opportunities to fertilize one’s natural curiosity, especially for youth. Here are nine excellent educational activities for children in the state. Arguably the first national park on Earth, Yellowstone’s one of those almost too-good-to-be-true sort of places. The inimitable natural bounty isn’t only awe-inspiring, it’s chock-full of educational opportunities. 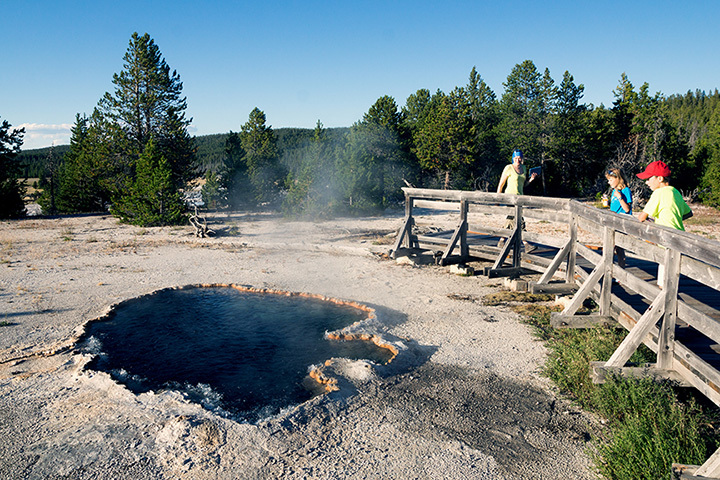 The 3,500-square-mile Eden showcases a wealth of wonder: Old Faithful, free-ranging bison, wolf packs, and the Yellowstone Caldera (North America’s largest super-volcano). For particularly exciting extracurriculars, the Expedition Yellowstone program is great for teachers and their students; and the Junior Ranger program informs and inspires the next generation. While substantially smaller than its famous cousin, and only a short distance away, Grand Teton is a less tame park. It’s gorgeously rugged and nostalgically harsh, harkening to the glory days of The Frontier and the flowery screenshots of old barns in mountain meadows, sentineled by snowcaps and worn fences. This park is also unique in its relatively insulated biosphere, a rather self-contained system that’s remained unchanged for eons. This insulation allows for unique chances to study, enjoy and, eventually, protect, the flora and fauna. Do the Junior Ranger program and soak in true Wilds. This nonprofit mecca for all things prehistoric is a boon to educating (and entertaining) all ages. Spawned from fossils discovered in the 1990s, the center used public funding to build a truly worthwhile museum. The real cool area is the Hall of Dinosaurs. Therein lies a full reconstruction of a T-Rex (loving named “Stan”), a Supersaurus (“Jimbo”) and the “Thermopolis Specimen,” the only Archaeopteryx outside of Europe. And if the museum doesn’t sate a fiending for dinosaurs, make like a real archaeologist and Dig for a Day. One hundred years after the death of its namesake, and as many since its founding, the Buffalo Bill Center presents an entertainingly attractive and attractively entertaining portrayal of the American legend. For under $20 ($12 for youth), this sleek museum experience tells the tale of the preeminent Western showman-frontiersman. A medal of honor recipient, outdoorsman, and renowned for his cowboys & Indians traveling shows, William “Buffalo Bill” Cody’s legacy comes to life at this historical center. The near-Quixotic adventures of this man, artfully presented, make it obvious why the very town takes his name. This humble, small-town organization is all about huge ideas. Particularly, Science Kids focuses on getting kids outside and making science accessible, fun and practical. Led by accredited educational and field experts, small class sizes venture into the surrounding ecosystems to not only learn, but apply, to be hands-on. This affordable immersion ($35-115) involves five-hour classes, four days a week, with passionate, experienced instructors, codifying two truly important goals of education: inspiration and practicality. Grand Targhee is one of a handful of premier ski areas that’ve preserved the best qualities of a frontier past(s). This truly enriched-and-enriching environment is ripe for that ideal melding of fun, inspiration and education. The nature center makes the most of its assets (financial and environmental), employing experienced, impassioned naturalists to provide instruction and adventure into the singular ecology of the area (“Ghee-cology"). So, embark on a guided snowshoe or ski nature tour, attend any number of science classes and courses, or grab a map and venture out spontaneously. Winter arrived! The lifts aren't running yet at @grandtargheeresort but the snow pack is incredible! Some endeavors into the “Old West” are gimmicky or inauthentic. But Bar T5, renowned for its covered wagon cookout, is unabashedly genuine. The immersion here is total, and it’s both fun and educational: Dusty trails lined with pine and rolling hills, the bouncing white of covered wagon roofs and cowboy hats, sizzling cast iron over open flame, period-appropriate manners and quips, nostalgic guitar tunes that echo into dusk. For brief moments, when these stimuli converge, somewhere amongst the buttered rolls and barbecue and whinnying of horses, families happily forget where they are. Or, more appropriately, when. Unbeknownst to many, Casper was an important historical thoroughfare, providing lifeblood to an expanding frontier West. Renowned excursions of Mormons, Pony Express pioneers and traffickers along the Oregon Trail all passed through the area. Hence the name of this educational center: understanding trails is understanding the veins that kept the beating heart of Manifest Destiny alive. A great museum, with captivating, lifelike displays invigorate an otherwise tired Western story. So much so, that the center established the student Docent program, geared towards educating, and empowering others to educate, children passionate about history.